For our second archive feature of 2019, I have selected a photograph (ref PS00923) that shows one of Provincial’s motor buses that was adapted for a new role during the Second World War. Taken at Hoeford depot in the early 1940s, it shows a Dennis saloon that was converted into an ambulance for Air Raid Precautions (A.R.P.) in Fareham. Thanks to research by member Stewart Brett, we know that Dennis ES MT 7868 was new in March 1929 to W D Beaumont (Safeway Coaches) of Enfield and later passed to A F England (X.L. Motor Service) and Luton Corporation before being acquired by the Gosport & Fareham Omnibus Company as its No.15 in July 1934. The bus saw a little over three years’ service with Provincial prior to its withdrawal at the end of September 1937. The next reference to the vehicle is in July 1939 when an article in the Hampshire Telegraph announced that ‘Fareham claims to have one of the largest and best-equipped ambulances in the country, designed particularly for A.R.P. 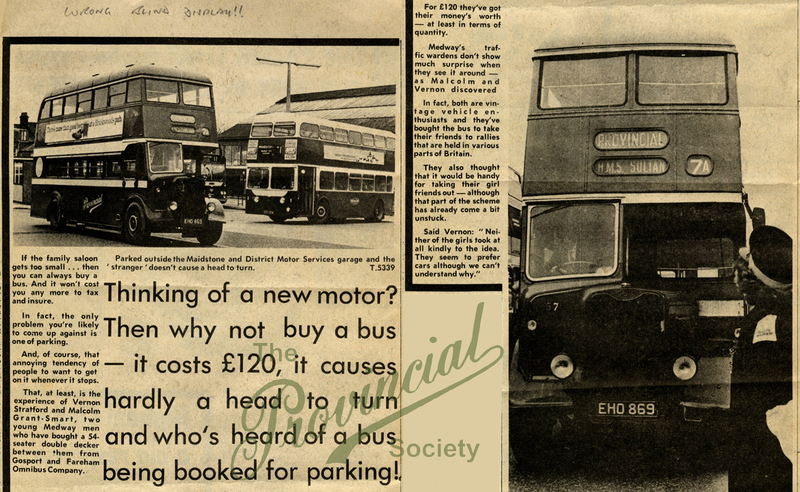 work, through the generosity of the Gosport and Fareham Omnibus company’. Described as a ‘magnificent gift’, the vehicle’s Strachan & Brown B32R body had been converted to be ‘capable of carrying, in addition to the nursing staff, 20 sitting casualties or eight stretcher cases, while the equipment includes a wash basin with a four-gallon water tank and two “roving” electric lamps for flood-lighting in the event of night operations’. The whole of the interior was reportedly finished in white enamel and the exterior in ‘standard ambulance grey’. The rear of the body was fitted with two large doors which gave ‘ample access to the stretcher fittings’. The newspaper account explains that ‘for several weeks, employees of the company have been engaged outside their ordinary hours at the Hoeford depot on the work of conversion, under the direction of Managing Engineer (Mr H Orme White) and the depot foreman, Mr J Aspinall’. The ambulance was handed over at the conclusion of a meeting of Fareham’s Urban District Council on Tuesday 11th July 1939. The vehicle’s subsequent history is a little less certain but, at some point, MT 7868 passed to a showman in Reading and was last licensed in September 1950. If any members or non-members have similar images that they would like to donate to the Society or allow to be photographed or scanned, I should be grateful if you would contact me – Chris Richardsen – using e-mail address ProvSocArchive@gmail.com. Now operating from Hoeford, on Solent Ranger services, (from 19/12) is SK68 TXO an all-white liveried StreetLite Max, one of 3 loaned by Wrightbus to First (the other 2 are with South Yorkshire).